While at the Nor’easters Catskill Hunt this past weekend, I received an X-Pointer pinpointer from the distributor to evaluate and he insisted I would be impressed. I had recently been hearing mention here and there about the new X-Pointer, and as always when trying out new products, I maintain and eager but skeptical attitude, until I actually see for myself how they perform in the field. Let’s face it, no amount of demonstration or video’s is a replacement for actually using the product yourself. I used the X-Pointer for about a 10 hour straight day of hunting on Saturday, and I did not baby it, I really put it to the test. This pinpointer has superior sensitivity, and is very stable with NO FALSING, and great depth. I was extremely pleased with it, and that’s putting it mildly. After pinpointing my targets with my machine, I was finding that a lot of the targets I was digging were in the 2-5 inch range on my VDI (which we all know is just a guide), yet a lot of them were actually deeper, and I usually start off digging my hole or plug about the same size for each target and work from there. Sometimes the target is deeper, and sometimes it’s in the plug. Now with my old pinpointer, it was always a kind of cat and mouse game. I would dig the plug, search around, and sometimes the target would be deeper than the display indicated. My old pinpointer was not picking it up, so I would go back over the hole with my machine (annoying), see that the target was still buried, dig a bit deeper, and repeat if necessary. Of course, we all know what happens when you can’t find the target—you get frustrated and start sticking the pinpointer all over the hole, pushing it in the dirt and against roots, trying to catch a signal, and then it begins falsing on you. You wonder if it’s really falsing, or if it was actually picking up the target. Frustrating. Well… this did not happen with the Xpointer! The only time it beeped was when a target was nearby! I found EVERY SINGLE TARGET I dug for, and I don’t know if it was the soil conditions, but I felt the range of the Xpointer, in my opinion, was greater than the manufacturer reports. It was so sensitive, it was identifying targets under rocks and roots at a much greater depth than any pinpointer I’ve ever used! Looks wise, the X-Pointer is similar in appearance to the new Minelab and Garrett pinpointers, which most people agree is a much sleeker and easier to use design than those old boxy pinpointers. It has a cap which fits very snugly over the tip, to protect the tip of the probe from wear. Kudos to the designers for that one–who doesn’t on occasion, use the tip of their pinpointer to help dig a target? There is also has a very handy security lanyard, with a low resistance coil and a plastic clip for attaching to your belt loop (or wherever). I found this to be a nice added security feature against accidental loss. The ability to turn off the sound rates high with me. With all the discrimination against detectorists that seems to be going on lately, I prefer to hunt in stealth mode; and its nice to have the option of the vibrate only feature to keep away those nosy, and possibly troublesome onlookers. If you want to be the owner of what I believe to be the best pinpointer on the market today, then I suggest you purchase one before you get put on a backorder list, because the more people who try it, the more who are going to want to buy it. 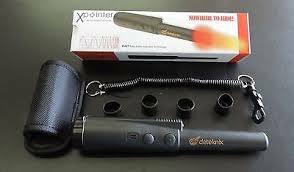 The X-Pointer is made overseas, has a two year warrantee, and is serviced by the US Distributor Gold Digger Metal Detectors. Looks like a comprehensive review, Allyson.. You say that it is made ‘overseas’. Would this be China? In 2008 I reviewed an American probe which went on to become a market leader. I have used it since then (still going strong) and it is currently ‘on loan’ and being wielded by a friend. Imitation being the sincerest form of flattery then Garrett must indeed be flattered! Will you come back in 5 years time and give us an update? You consider this to believe to be” the best pinpointer on the market today,” That’s a very bold statement. Have you tried the White’s TRX (also made in the States) or the Nokta? The TRX is a very good pinpointer, and also very, very expensive. When I say the best on the market, I’m talking about the over all value. For $89.00 you get a probe that doesn’t false, goes deeper than the Minelab and Garrett, and has a full warranty, serviced in the USA. The only thing it has in common with the Garrett, is the look. Operationally, it is superior, with different modes and sensitivity levels, and of course the main thing is that it does not false. Doesn’t matter to me where it’s made, so long as it works. We at http://www.detectorbits.co.uk are the only sellers of this great new Xpointer in the UK & Ireland. I could Echo your words entirely Allyson, Non Falsing, extra depth just a brilliant piece of equipment at a good sensible price. We are already nearly sold out of our first shipment and have had to reorder much sooner than we thought. What customers also like is the choice of bright colours available as well as the standard black. We also have Woodland Camo, Gray, Orange, Yellow and for all the ladies amongst us Detectorbits have talked the manufacturer into making a nice Pink version to come on the next shipment. Yes Tony, I was talking to the US distributor, and found out they are coming out with a pink version for us ladies. Awesome! Wondering if I can trade mine in now for the more feminine color? And less chance of it blending with leaves and such and getting lost.